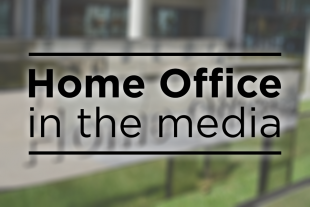 Today’s Home Office in the media stories include a new Policy Exchange report on treason law, the Stephen Shaw Review, Economic Cost of Crime figures and public sector pay rises. The Telegraph, The Times and The Guardian cover a report by think tank Policy Exchange, which is co-authored by Tom Tugendhat, the Conservative chairman of the foreign affairs committee. The Telegraph writes that the report argues a new offence would "mark out treasonous acts" and allow the courts to impose "justifiably severe punishment" and that it says that the offence should be updated based on the laws of Australia and New Zealand. The coverage also states that it would make it an offence to aid a state or organisation either attacking the UK or preparing to attack the UK and that it would apply to British citizens, wherever they are in the world. “There is clear merit in the need to look across a range of existing legislation to ensure they are up to date and can counter emerging threats. The Independent reports on the second Stephen Shaw review into detention for vulnerable immigrants. The paper says that the government-commissioned review found that thousands of vulnerable people are being locked in “unacceptable” conditions in immigration removal centres, often for “deeply troubling” lengths of time. The paper notes while there has been a drop in the overall detainee population, the number of people held in removal centres for more than six months has increased. “Detention is an important part of the immigration system - but it must be fair, dignified and protect the most vulnerable. “Under these reforms, we will work with our partners to develop alternatives to detention. We will also improve support for the most vulnerable, introduce a new drive on dignity in detention and be more transparent. The Times and Daily Mail report on the economic cost of crime figures with the Times highlighting that the cost of each murder in England and Wales is more than £3 million. The Times reports that the estimated total figure – which includes the approximate costs for physical and emotional harm of crime – for offending against individuals, excluding cyber crime and fraud, is £44 billion. The paper reports that the increase in the total cost of a murder from £1.7million to £3.2 million in 2015/16 is due to inflation and the use of better methodology to asses the physical and emotional impact of murder. “This Government is determined to end the cycle of violence which, as this report highlights, is having such a devastating impact on our young people and communities. “Our new Serious Violence Strategy puts a stronger focus on steering young people away from violence whilst continuing to ensure the strongest possible law enforcement response. The Times, Independent, Daily Mail, Daily Express, Daily Star, Evening Standard and Metro all report on the public sector pay increases. All report that the rises will not be covered by any new money but rather from savings by services and departments. The majority of reports say that the increase will take average police pay to more than £38,600. "Our police officers do an incredible job in the face of complex crime and rising demand, and I'm grateful for their continued dedication to keeping us safe. This award represents the highest consolidated pay award since 2010.